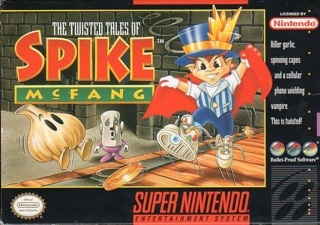 Twisted Tales of Spike McFang for Super Nintendo allows you to play as Spike McFang (a junior magician and vampire in training) as he tries to rescue his island home from the dastardly Von Hesler. Using magical powers, Spike will have to journey through nine different environments to help his father, Dracuman, regain power over his nemesis. As Spike, you'll have some unusual weaponry at your disposal: a magical hat and black cape are your ammunition against killer garlic, zombies, and other dangerous beings.